I absolutely love chicken wings or fingers slathered in Buffalo sauce. It is my go-to treat when watching the game or out at a local watering hole. 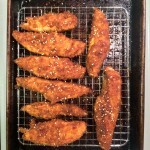 However, unable to control my love for them and fearing buffalo wing overload, I try not to make them at home too much. If I do have a craving for wings or fingers, I usually try to come up with something other than classic buffalo style sauce, which is where this sweet-spicy Asian style sauce comes from. It’s tangy, sweet, salty and just the right amount of hot. It is a really fun and easy way to elevate boring old chicken. 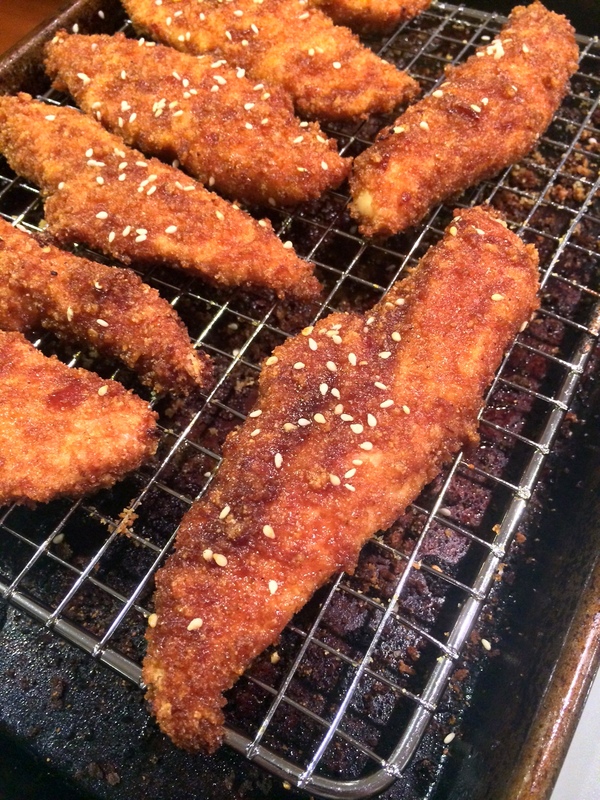 The chicken fingers are also baked, so they’re healthier than standard deep fried wings and fingers. I served mine over a bed of white rice with a few squirts of Siracha. These wings are perfect for a weeknight meal or for the big game. Pre-heat oven to 450 degrees. Place a wire rack on a sheet pan and brush with vegetable oil. Whisk milk and egg together in a medium bowl. Add chicken tenders. Set aside. Mix breadcrumbs and cornmeal together in a shallow dish or plate. Season with pinches of salt and black pepper. Remove each piece of chicken from the milk mixture and dredge through the breadcrumb mixture, pressing lightly to ensure an even coating of crumbs. 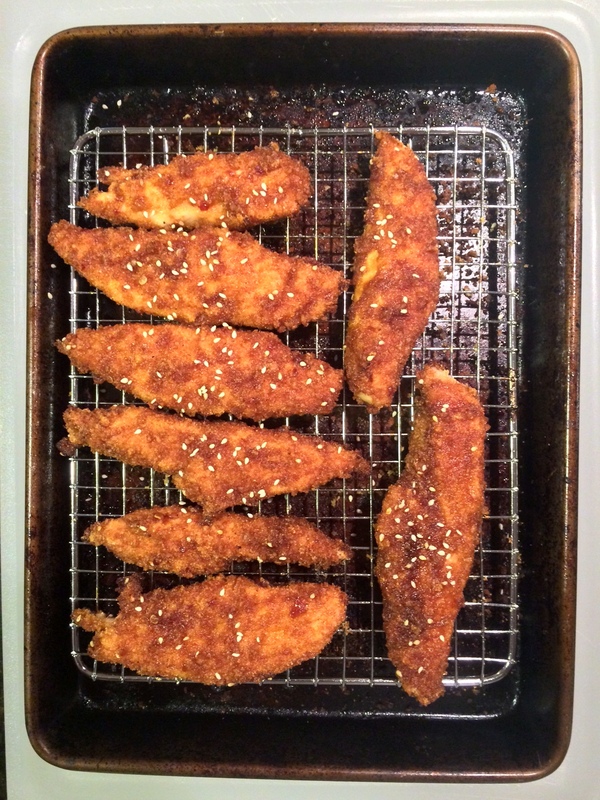 Place chicken on wire rack on sheet pan. Continue until all chicken has been coated. Spray the top of each chicken finger with cooking spray. Meanwhile, add 1 tbsp. 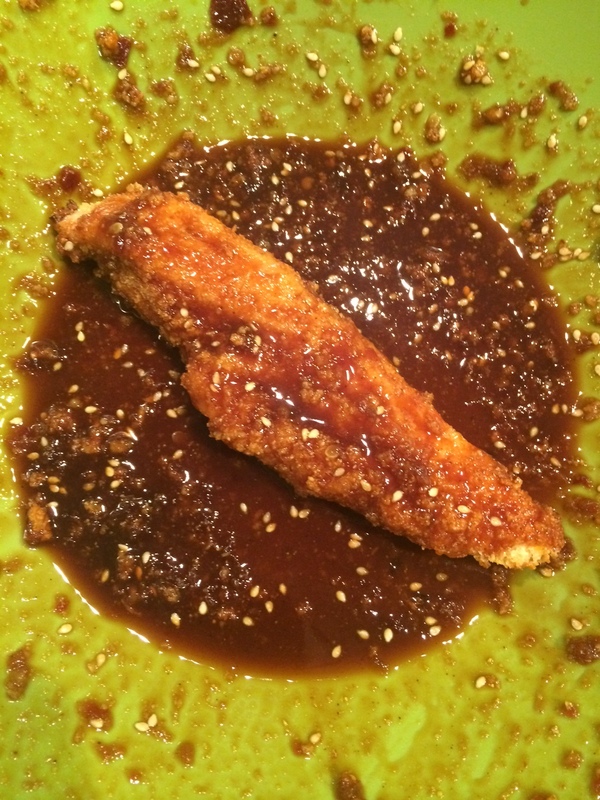 of the sesame seeds and the remaining ingredients to a medium bowl. Whisk until everything is well combined. After 10 – 12 minutes, flip chicken over and cook for another 10 minutes. 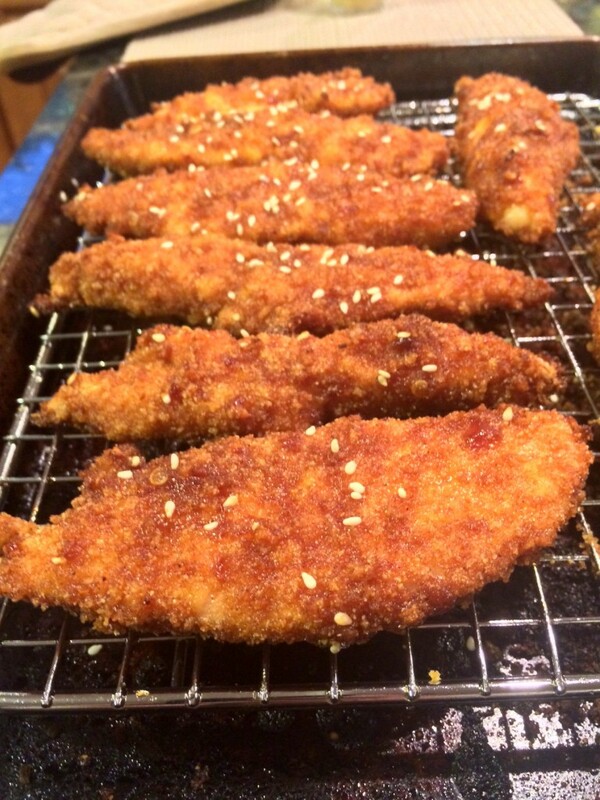 Remove chicken from oven and toss with sauce until each finger is well coated. Put back into the oven for another 5 minutes. Remove from oven and garnish with remaining sesame seeds.